All cultures have their peculiar bridal looks. Likewise, Gujarati brides too have a unique look when it comes to their wedding trousseau and makeup. Gujarati brides wear a very unique style of saree which is called a panetar. A panetar is a delicately designed white saree with embellishments or bandhani patterns in red and green. The look of the overall saree is based on the white colour and hence it can be tricky to do the makeup according to the outfit. Here are some handy tips to keep in mind when opting for gujarati bridal makeup. 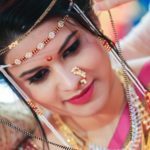 A typical Gujarati bride is clad in several elements like a traditional saree or a lehenga embroidered with bandhani or filled with embellishments and numerous accessories. In order to balance out the look, it is best not to overdo the makeup and keep it simple. In Gujarati bridal makeup, the colours are kept at a minimal and are not at all flashy. Eye makeup is of utmost importance when it comes to Gujarati bridal look. The base has a natural finish to it and eyes are quite decked up. For perfecting this look, the eyes have to look extremely glamorous and therefore it is best to use a bold eyeshadow along with kohl pencil, mascara and an eyeliner. A dark lip shade will complement the neutral base and will also add drama to the simple look. It is best to add a bit of gloss which pairs up with the selected lip shade to add shine to the lips. Go for the shades of reds and maroons to perfect this bridal look. 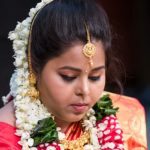 Well, if you are looking out for a makeup artist for your gujarati bridal makeup then see to it that the artist has complete knowledge about your attire!